On the western border of South Dakota, the Black Hills are an oasis of spruce and pine forest, colorful granite outcrops and burbling creeks in an ocean of dry plains. Slicing through mountains, the George S. Mickelson Trail honors the state’s former governor who crusaded for the trail before his tragic death in 1993. Journey along the 109-mile route, nicknamed the “High Line,” which cuts through terrain as rugged as the characters who once panned here for gold. You’ll also trace the history of the Wild West’s boom-and-bust era. 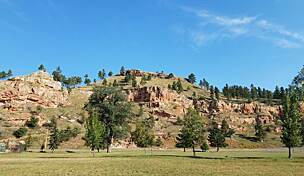 Fly into Rapid City and drive about 47 miles to Calamity Peak Lodge, 2 miles east of Custer, the oldest town in the Black Hills and named for the ill-fated general defeated at Montana’s Battle of the Little Bighorn. Our proposed itinerary includes three days of one-way riding with arranged shuttles. Rent bikes from Mickelson Trail Adventures, an official Black Hills National Forest Service transport vendor. 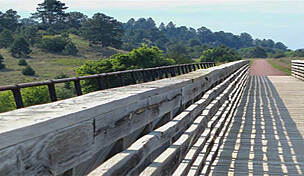 Located north of Custer in Hill City, they also offer shuttles to all the trailheads (4-person minimum). For a fee, they will bring bikes to you in Custer, or you can pick them up yourself. You can also rent from Frontier Bike Rentals in Custer (using Mickelson Trail Adventures for shuttling). For those with physical limitations, 4-hour trolley rides along the trail are available by reservation during the summer (Deadwood and Hill City trailheads). Contact the Mickelson Trail office (605-584-3896). Important: Water is turned off at trailheads during winter; however, bring ample water even in summer because towns are far between. 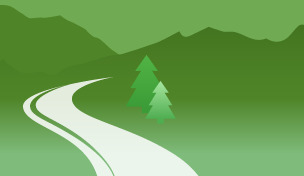 In places, the trail is remote, and cell phone coverage is poor at best; we recommend packing a basic first-aid kit. Because of forest fire risk, smoking is strictly forbidden along the trail. Also, some parts of the corridor are surrounded by private land, so please stick to the main route. Even during a hot summer day, a cold storm could blow in unannounced; dress in layers, or at least pack extra ones. And finally, trail passes are required for those aged 12 and older. Purchase them from bike shops or at trailhead kiosks. Start your day with breakfast in town at Baker’s Bakery and Café, where people come from all around to savor their homemade bread and delectable pastries. Their breakfast burrito will set you up for the ride ahead, enough to carry you all the way to Edgemont. From Custer to Edgemont it’s mostly down hill (44.5 miles one way). The trail begins by coursing through beautiful mountain meadows sprinkled with small communities and ranches. As you ride, keep your eyes out for evidence of former railroading days: original mileage markers and “W” signs, which signaled train conductors to blow their whistles to warn of their approach. At mile post 37 look for concrete fence posts put in by the railroad. 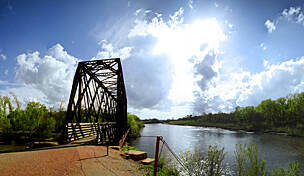 The bridge is one of the only two made of concrete on the Mickelson Trail, and you’ll see an original bridge number marker on the southeast side. You reach Pringle after only 12 miles, and if you’re hungry, or need to whet your own whistle, stop at the Hitchrail Bar and Restaurant—the trail passes right by it. Around the old Lein gravel quarry you’ll notice the white rock, indicating limestone, which was once mined here. Look for the ruins of old kilns. From this point south, you’ll be in what’s called the southern hills, and the countryside starts to open up. At Sheep Canyon, an interpretive sign describes what was once the largest trestle on the route— 26 feet high by 700 feet long. 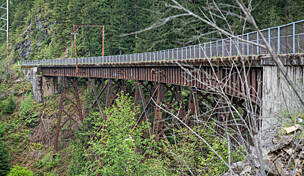 It was also the most dangerous, and the engineer and caboose man often walked across rather than rode the train! Today it’s a safe earthen dam. 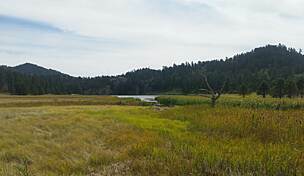 As its name implies, Edgemont sits on the edge of the Black Hills. The trail ends—or begins—along the banks of the Cheyenne River at Teddy Roosevelt Park, where the president once spoke from the pretty gazebo. The Grand Island and Wyoming Central, a subsidiary of the Chicago, Burlington and Quincy line, began building the railroad here in 1890. While you’re waiting for the shuttle back to Custer (about 41 miles; 45 minutes), have a drink at the Hat Creek Grill (521 2nd Ave.), right next to the park. Tonight, enjoy a prime buffalo burger at Black Hills Burger & Bun, along with reduced prices on beer and wine Friday and Saturday nights. 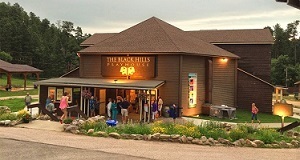 Following supper, drive out to Custer State Park and see a show at the Black Hills Playhouse, or check out Mount Rushmore in nearby Keystone, where lights set the iconic faces aglow at night. Either head north along the trail—Custer to Rochford—and shuttle back, or shuttle to Rochford (about 35 miles; a 1-hour drive) in the morning and ride south to Custer (about 38 miles). Either way, the roller-coaster segment offers little net gain or loss in overall elevation. Our itinerary heads south from Rochford to Custer. Sacred to the Lakota Indians, the Black Hills succumbed to settlement when gold was discovered in the 1870s, courtesy of George Armstrong Custer’s Black Hills Expedition. By 1878, the Rochford settlement thrummed with makeshift cabins, saloons, stores, hotels, a post office and school, only to be all but abandoned four years later when miners moved on to other lodes. Today your ride includes three of the trail’s four tunnels. About 4 miles south of Rochford, look for the large waterfall before arriving at your first tunnel (Tunnel C). After you emerge from the granite fissure, the trail loops through a narrow canyon to the old mining town of Mystic. First called “Sitting Bull,” Mystic was the site of an experimental operation on Castle Creek. Built in 1904 by the Electro-Chemical Reduction Company, the industrial plant tried to extract gold by processes called electro-cyanide or electro-chlorination. The failed site received new life as a sawmill; learn more from the interpretive signs. Mystic was also where the Chicago, Burlington & Quincy line intersected the Crouch Line, which ran from here to Rapid City. Look for the remains of an old railroad roundhouse near the creek. Pass through two more tunnels (B and A), one of which is ribbed with beams, making it look like a giant keyhole. Climb up the mountainside to Redfern and coast into picturesque Hill City. Stop for lunch at Linda’s Deli (355 E. Main), known for their huge sandwiches. For a sugar-filled boost, sink your sweet tooth into some homemade fudge or creamy caramel chocolate at Turtle Town, a local confectioner. The Black Hills Central Railroad is right next to the trail in Hill City; come back another day to take the 2-hour roundtrip journey on the 1880 Train to Keystone (reservations required). From Hill City you’ll have another steady climb up the mountain through a narrow valley scattered with ranches. You’ll wind among more meadows cut by trickling streams, while feeling refreshed by the ponderosa pine scent wafting through the air. 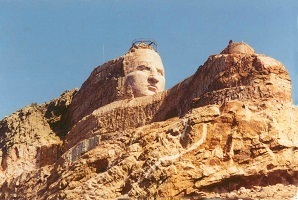 Shortly after you start your descent again, pull over at trailhead 9 (mile 49.6/59.2) to view Crazy Horse Memorial being carved into the granite ridge. The face is clearly visible and the hole beneath his arm has been blasted. Carving began in 1948, though it will be decades before the sculpture is finished. From Crazy Horse, Custer is only five miles, all downhill. After your ride, drive 56 miles to Deadwood and check into the Historic Bullock Hotel downtown. You can hardly swing a cat in Deadwood without hitting a casino, and this hotel, like most others, has one. Rent bikes from Two Wheeler Dealer in nearby Spearfish. Our itinerary calls for arranging a shuttle to Rochford in the morning and riding back to Deadwood. Alternatively, you can ride out and back or arrange for a shuttle to pick you up in Rochford at day’s end. Shuttle to Rochford (about 22 miles; 40 minutes) to begin the final leg of the trail north back to Deadwood (24–26 miles depending on whether you take the loop near Lead). A little more than two miles into your ride you’ll arrive at the fourth and last tunnel (Tunnel D) bored through the pine-carpeted hillside. Along the route through mountain meadows and forested slopes, keep your eyes open for remains of the Black Hills mining, logging and railroading heyday: old buildings and retaining walls, mine adits, telegraph poles and original concrete railroad markers. Near the former town site of Nahant, Custer reportedly shot a grizzly bear. Sadly, there no grizzlies in the Black Hills today. Just north of Dumont trailhead, you’ll reach the highest point on the trail (just over 5,700 feet)—in case you couldn’t tell from your pounding heart and aching thighs. So what does this mean? It’s pretty much all downhill from here to the end! Around Englewood (mile: 98.5/10.3) look for remnants of this area’s railroading center. At one time there was a roundhouse, depot, water tower and small rail yard. 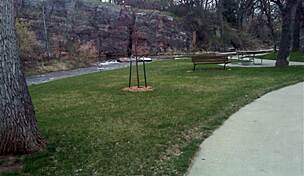 A stagecoach stopped here, too, in the late 1870s, and in the 1880s, a rail line from here branched to Spearfish. Less than 0.5 mile north of Englewood, the trail splits in two: the east fork is the main railroad grade and winds down along the creek to Deadwood; the west fork heads up to Whitetail Summit, which offers views of the old mining town of Lead. The trails converge again at the bottom just south of Lead. Whichever fork you choose, as you coast down the canyon, bask in the satisfaction of completing all 109+ miles. For more railroading history, check out the small railroad museum at trail’s end. Consider spending an extra day or two in Deadwood, a prosperous placer camp in the late 19th century and now a tourist hotspot flaunting its Old West image. It’s also a National Historic Landmark through which many notable characters passed, including “Wild Bill” Hickok and Calamity Jane. Both are buried at Mount Moriah Cemetery. Saunter by Saloon #10 (622 Main St.) to witness the “shooting” of Wild Bill and the capture of Jack McCall, deadly perpetrator. The Wild West shootouts are held daily (except Mondays) during summer. McCall’s trial takes place at the Masonic Temple. Take an underground tour of the Broken Boot Gold Mine and learn about the local gold rush days at the Days of ’76 Museum. You can take a walking tour of town, stopping by many more historical sites, including the Adams House and Adams Museum.